On the 18th green, rules official David Price lets Dustin Johnson and Nick Watney know of the devastating two-stroke penalty. Dustin Johnson driving a golf ball is an experience that unfolds in distinct stages. It begins when he arrives on the tee. Liquid, he struts. Johnson is an imposing man--6' 4" and 190 pounds, all arms and legs--but he moves with a rare ease, unhurried and unbothered. "He's the ultimate cool guy," says PGA Tour player Brendan Steele. "Fans respond to him more like a movie star than a golfer." When Johnson unsheathes his driver, a perceptible current runs through the gallery. Fans lock eyes and nod. As he stands over the ball, his limbs are loose, his bearded face the picture of calm, but the silence around him is fraught with anticipation. Remember in Pulp Fiction, when John Travolta is about to slam the plunger of adrenaline through Uma Thurman's sternum? It feels a little bit like that. Johnson's backswing is cartoonish, his long torso corkscrewed into a seemingly impossible angle, his right wrist as cupped as a waiter carrying a tray of champagne flutes. The club comes crashing down in an act of violence. After he slams the driver head into his poor ball--"It sounds like gunfire," says Tour veteran James Hahn--there's an audible sizzle as the missile pierces dead air. Before the drive has reached its apex Johnson has usually picked up his tee and begun flowing down the fairway. This sets the stage for the most surprising of all sounds surrounding a Johnson drive: laughter. It is spontaneous and giddy, people so astonished by what they have just witnessed that, collectively, all they can do is titter. 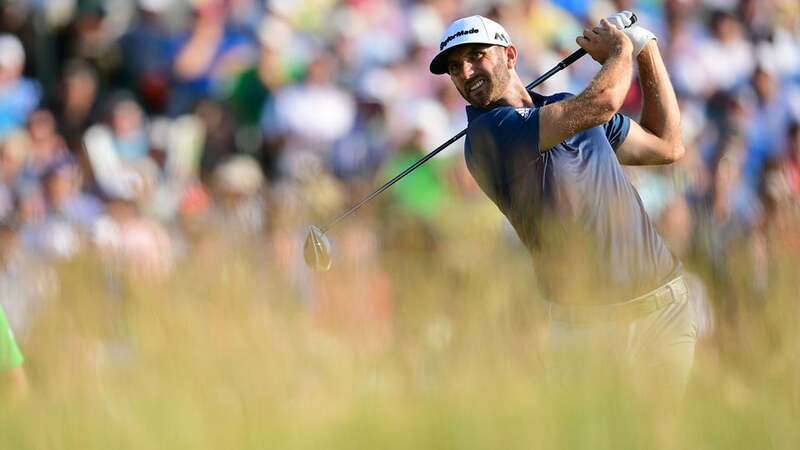 The Dustin Johnson experience played out again and again last week at the 116th U.S. Open. Even amid the tension of the final round, at fearsome Oakmont Country Club outside of Pittsburgh, Johnson bashed away with utter fearlessness. His first two drives traveled a combined 693 yards, leading to a stress-free par on the toughest opening hole in championship golf and a two-putt birdie from the collar at the 320-yard 2nd. Johnson never stopped attacking; another booming drive on the brutal, uphill 9th set up an eight-foot birdie putt that pushed him to five under par, and when Shane Lowry bogeyed the same hole moments later, Johnson held the solo lead, having made up five strokes on the third-round leader on the front nine. However insouciant Johnson may be, it was never going to be an easy stroll to victory, not with his star-crossed history in the majors, which includes a three-putt from 12 feet on the 72nd hole to blow an opportunity to win last year's U.S. Open and a final-hole rules imbroglio at the 2010 PGA Championship, when a penalty stroke for grounding his club in a bunker cost him a spot in a playoff. When Johnson reached Oakmont's 12th tee, the thrilling anticipation of watching him pound a driver on an endless par-5 gave way to the tedium of a board meeting. A phalanx of USGA officials informed Johnson that he was facing the possibility of a one-stroke penalty, retroactive to when his ball had twitched as he was standing over a short par putt on the 5th hole. At the time Johnson told the walking official that the ball had moved on its own, which would mean no penalty. His playing partner, Lee Westwood, concurred. On a steeply pitched, ultrafast green such as the 5th, gravity can indeed set a ball in motion. The USGA's concern was that Johnson's actions alone had made the ball move; perhaps his practice strokes or picking up the putter shifted a few blades of grass or created a breath of breeze. (Lowry had assessed himself such a penalty stroke on Saturday.) The blue coats were effectively saying one of two things to Johnson: We don't believe you or We don't think you understand the rule. Either way he was being impugned. To make matters worse, Johnson was told on the 12th tee that a final ruling would not be made until after the completion of his round, when he could review video of the incident with the USGA's four-person rules committee. Just like that the tournament was plunged into chaos. Lowry had bogeyed the 10th hole, so Johnson's lead was two strokes. Or was it only one? Across the course other competitors were informed of this unsettling uncertainty. Meanwhile, Twitter pulsated with outrage. Tiger Woods and Rory ­McIlroy both called the situation a "farce"; Jordan Spieth went with "joke"; Rickie Fowler settled on "laughable" and "ridiculous." But a funny thing happened: Seemingly the only people in the golf world who kept their cool were Johnson and his kid brother, Austin, who serves as his caddie. Austin implored his boss not to look at any scoreboards and to keep swinging for the fences. "We like to keep it simple, that's for sure," says Austin. "We're two pretty easygoing Southern boys who just like to have fun." To put it politely, on Tour the Johnson brothers of Columbia, S.C., are not known for having a cerebral approach. "There are so many funny stories," says Tour player Billy Horschel. "At Doral last year we get to 16, and for Dustin it's a drivable par-4. They're going through the yardage guide, and they can't figure how far it is to the green. After a long while Dustin says, 'Bro, you wanna hit?' I said sure, because I was laying up. So I hit, and it takes them a few more minutes to pull a club. Finally Dustin rips one onto the green. Walking off the tee, he's like, 'Bro, A.J. does not know how to add. He can't do numbers.'" Of course Dustin couldn't figure out the yardage, either. Nevertheless, on the back nine on Sunday, Austin kept saying all the right things and Dustin kept making all the correct plays, beginning with a 365-yard bomb off the 12th tee. The U.S. Open is a war of attrition, and the Johnsons stacked up par after par (with the exception of a three-putt bogey on 14) and let everyone else beat himself. Lowry developed sudden onset yips and bogeyed 14, 15 and 16. Sergio García reached three under with a birdie at the 13th and then bogeyed three straight holes. Scott Piercy also got to three under but promptly gave shots back at 16 and 18. So Johnson stepped to the 72nd tee at four under and with a three-shot lead. That is, unless he was three under and the lead was two. Either way the cycle repeated itself one last time--arrival, anticipation, windup, annihilation, laughter. Standing behind the 18th green, even Jack Nicklaus was impressed. "This game has seen some very long, very straight drivers of the golf ball," he said. "I need to think on it a little bit more, but this fellow could be at the top of the list." From 191 yards Johnson covered the flag with what he called "one of the best shots of my life," a six-iron that left him with a kick-in birdie. After the round he huddled with officials and despite his mild protestations was assessed the penalty. So a 68 was turned into a 69, but the stylish finish and comfortable margin of victory helped save the USGA from itself. Johnson blew off the whole kerfuffle with a classic Dustinism: "At the end of the day it didn't f------ matter." Johnson's journey to becoming a national champion began pretty much the moment he yanked a four-foot birdie putt on the 72nd hole at Chambers Bay last year, when a make would have forced a playoff with Spieth. "We got so close and watched it slip away," says Austin, "so we said we're going to do everything possible to prepare for the majors this year." The near miss had come a little early in Dustin's reinvention. He had resumed playing in February 2015 after a six-month leave to address "personal challenges." Johnson, who turned 32 this week, had long been known as a skirt chaser and for partying to excess. But during his time away he and his fiancée, Paulina Gretzky, welcomed a baby boy, Tatum. Working with a life coach and several clinicians, Johnson gained hard-won self-knowledge and mechanisms for coping with stress. Golf's bad boy has settled into a quiet domesticity. (He recently christened a new boat, Just Chillin.) "He's such a loving dad and partner, so generous and kind," says ­Paulina. "He's our rock. And he keeps evolving. I wouldn't say he's grown up; he's becoming who he is supposed to be." As Johnson has grown more comfortable in his own skin, he has at long last dedicated himself to achieving his awesome potential. He used to enjoy visiting swing coach Butch Harmon in Las Vegas because that allowed for long nights on the green felt. But the sessions with Harmon were too infrequent, so now Johnson works more regularly with Butch's son Claude Harmon III, who is based near Johnson in South Florida. He has also become a gym rat. "He's relentless, every single day," says Joey Diovisalvi, Johnson's trainer. "The perception has always been that Dustin coasts on nothing but natural talent, but that's not the reality. He has chased greatness really hard." With a more efficient swing and more muscle, Johnson has gone from an extremely long hitter to "crazy, crazy long," says Steele. "I was 16th on Tour last year, and he still hits it 30, 40 yards past me. Stats won't show it, but that's the reality. What's more incredible is that he hits it so straight." Johnson's driver has usurped Spieth's putter as the Tour's most lethal weapon. Modern metrics have upended the maxim of drive for show and putt for dough, demonstrating that a powerful long game is the surest path to victory. Johnson's tour de force at Oakmont is a case in point. Because of rain delays, he crammed his first and second rounds into Friday, and he simply overwhelmed the softened course, at one point hitting 25 consecutive greens in regulation in a dazzling display of ball striking. Rounds of 67 and 69 staked Johnson to a one-stroke lead. Sloppy wedge play hurt him during a third-round 71 and raised old questions about whether the bomber could summon the finesse, and grit, to get the ball in the hole at crunch time. The 10-footer he made on the 70th hole to save par should end that discussion. Johnson, who tied for fourth at the Masters in April, is up to third in the World Ranking, and this is the ninth straight season he has won a tournament, the longest such streak on Tour. His dozen top 10 finishes in the majors are testament to his ability to consistently rise to the occasion. Says his agent, David Winkle, "He has played his best golf on the hardest golf courses at the most important times, and that's what great players do." Winkle has been by his man's side since Johnson came out of Coastal Carolina. They've been through a lot of heartache together, so after the final putt dropped, Winkle wrapped Johnson in a bear hug, indicative of the fierce loyalty of the people around him. 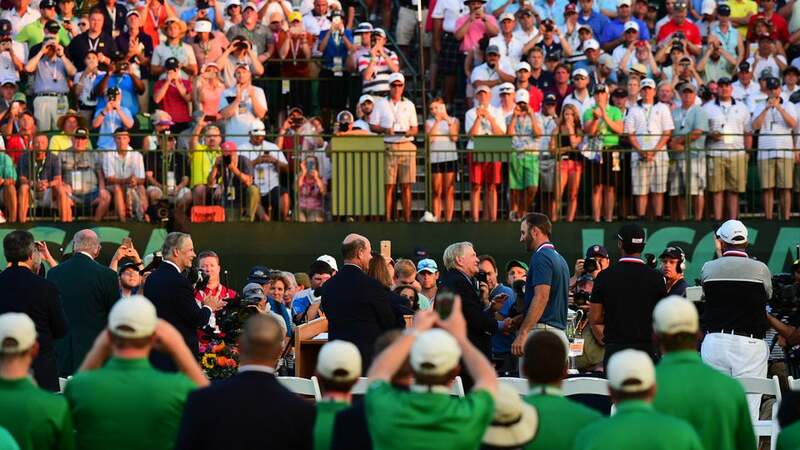 "You're a U.S. Open champion," Winkle shouted in Johnson's ear. "You're on a path to the Hall of Fame and you're gonna get a lot more of these." Johnson is a man of few words, so he offered only two: "Damn right."